This large black granite* stone marker with a polished top and natural sides also doubles as an urn to make a lovely addition to your memory garden. 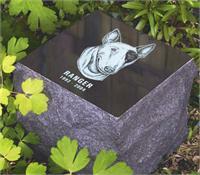 Shown with optional engraving of name and dates and optional breed-specific artwork (each purchased separately). You may order name and date personalization here - please see bottom of page for breed specific artwork details. Closure: Bottom-opening threaded stopper 10"W x 10"D x 9"H 200 cu. in. Stone Weight: 60 lbs. *Due to the nature of granite, color and patterns will vary. Which breed artwork would you prefer?